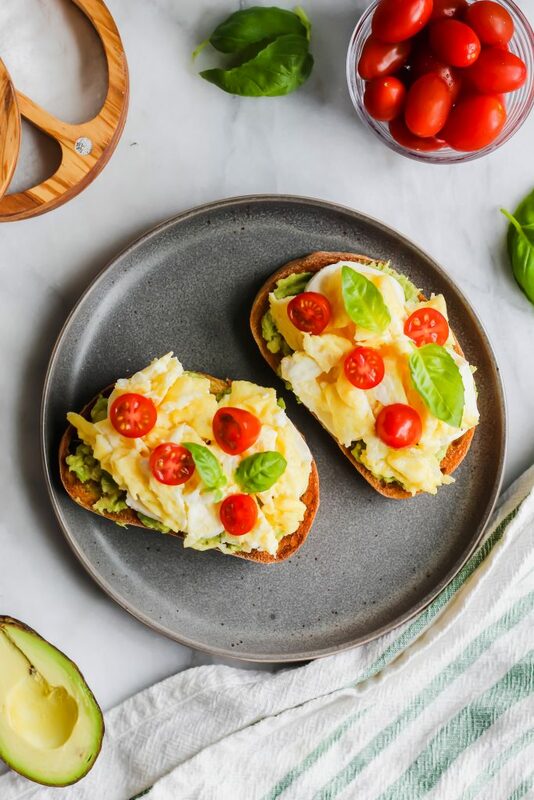 This Caprese Avocado Toast is the perfect easy, no fuss Spring breakfast! It combines the classic caprese flavors you love like mozzarella, basil and tomato! It’s fresh, easy and delicious! I feel like I am continually starting out blog posts saying how I used to hate a certain vegetable (or fruit in this case) and now I love it – ha! Avocado was definitely that way for me. I remember when I was younger and we would go to Mexican restaurants, I would say NO guacamole for a dish that came with free guacamole! RIP TO ALL OF THE GUAC I SAID NO TO. I’M SORRY. But once again, my taste buds changed and now there pretty much isn’t a snack I like more than a big fresh batch of guacamole. 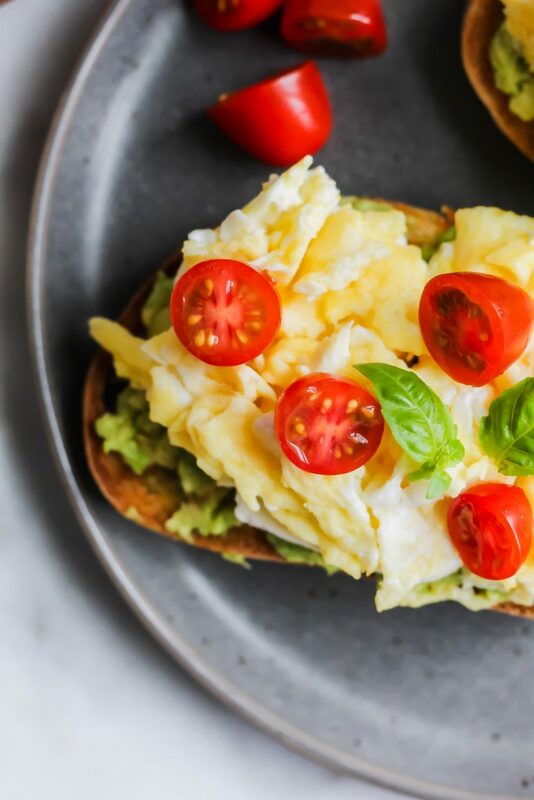 And I’ve been hard pressed to find a breakfast that I love as much as this Caprese Avocado Toast! 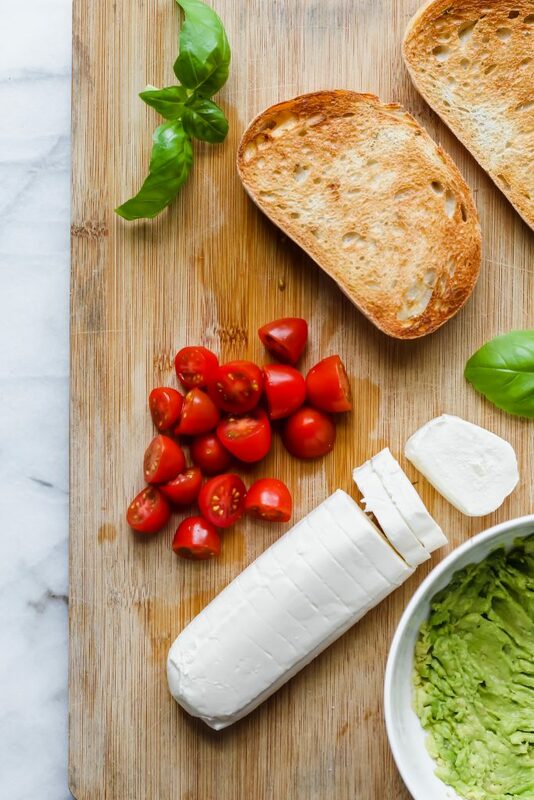 Caprese is a classic Italian dish that’s composed of mozarella, basil and tomato! Sometimes it also has a delicious balsamic glaze on top. It’s a wonderful appetizer, snack or salad. I MEAN. Could you want anything else for breakfast?! 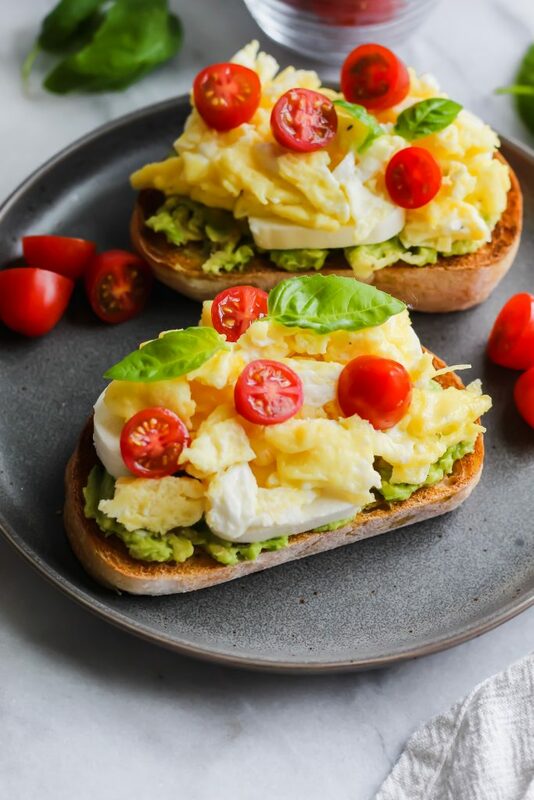 It’s creamy from the avocado and mozzarella, it’s salty and buttery from the scrambled eggs, it has the perfect amount of acidity and juiciness from the tomatoes, a great crunchy texture from the bread, and finally it’s deliciously herbacious (yes I just made up this word) from the fresh basil. It’s wonderful. 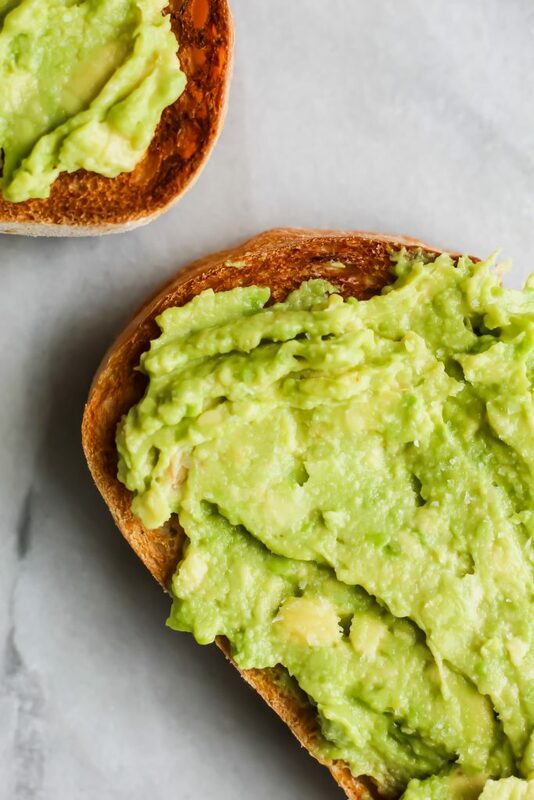 So even though I know it’s not like, rocket science to make a slice of avocado toast, I’ll still walk you through it because that’s how we roll here at OBB. First, slice the loaf of bread into 2 thick slices! Toast them until desired crunchiness. For me, it’s golden brown and slightly crunchy. While it’s toasting, take the time to do everything else! In a non-stick skillet, melt about ½ tbsp of salted butter on medium heat. While it’s melting, crack two eggs into a small bowl or cup. Add salt and pepper to taste and a dash of milk (about 1-2 tbsp) and then mix well. Once the butter is melted, add the scrambled eggs directly to the pan. Using a rubber spatula gently move around the eggs until they’re fully cooked through. This usually takes about 2 to 3 minutes at the most. You never want to overcook them. You want them to be light and fluffy and buttery and delicious! Set them aside, keeping them warm on the stove. Slice the avocado in half – remove the pit. Using a spoon, scoop out the inside of the avocado into a small bowl. Mash it with a fork until mushy and delicious. It may resemble baby food but that’s the vibe we are going for so it’s easily spreadable. Next, the mozzarella log I purchased from Aldi was pre-sliced. If yours is not, slice it as thick or thin as you want. For the size of my bread, 3 slices of mozzarella fit. You can do as many or as few as you’d like. Lastly, slice 4-5 cherry tomatoes in half. By now, the toast should be done! TIME TO ASSEMBLE! Add a thick layer of avocado to the toast. Add a generous pinch of salt on top of the avocado. Next, top the avocado with 2-3 fresh mozzarella slices. Add a generous amount of scrambled eggs on top of the mozzarella. Top the eggs with the sliced cherry tomatoes and fresh basil. Add a sprinkle of salt or pepper on top. 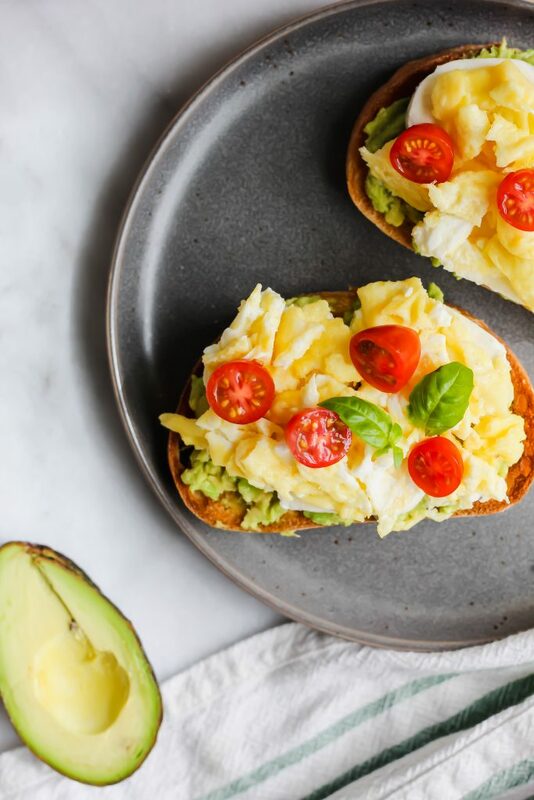 But really, this Caprese Avocado Toast makes my heart so happy and makes me feel all the warm weather vibes. It’s easy, delicious and a refreshing start to your day! I hope you make it and love it as much as I do! Did you enjoy this recipe? Here are a few more you might like! Begin by toasting the bread. While it's toasting, melt the 1/2 tbsp of butter in a non-stick skillet on medium heat. Crack two eggs into a small bowl. Add 1-2 tbsp of milk and salt and pepper and mix to combine. Pour the eggs into the melted butter. Using a rubber spatula gently move around the eggs until they’re fully cooked through. This usually takes about 2 to 3 minutes. You never want to overcook them. You you want them to be light and fluffy. Once they're done, keep them warm on the stove. Slice the avocado in half, remove the pit and scoop the inside of it out with a spoon into a bowl. Mash with a fork until easily spreadable. Set aside. If the mozzarella log isn't already sliced, slice it into 4-6 thick slices. Slice your cherry tomatoes in half. By now the, toast should be done. Add a thick layer of mashed avocado to the bread followed by a generous pinch of salt. 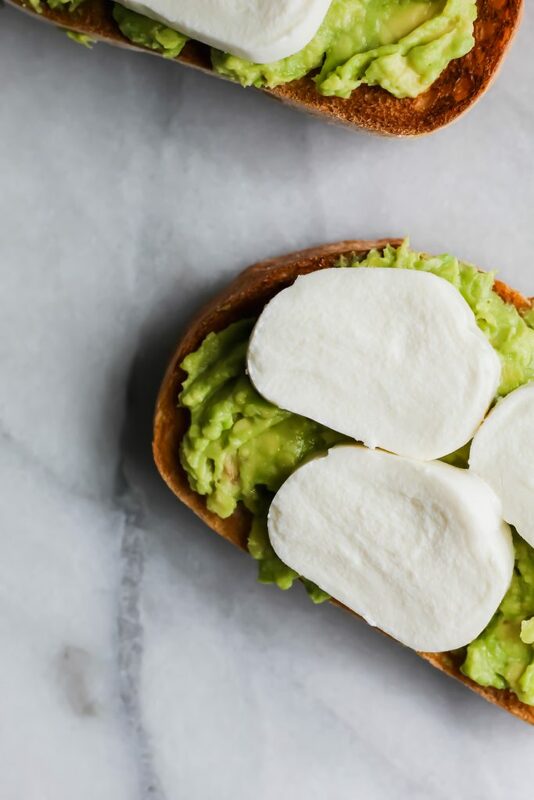 On top of the avocado, add the mozzarella slices. Next, add a generous amount of the scrambled eggs. Top with the cherry tomatoes, fresh basil and salt and pepper. 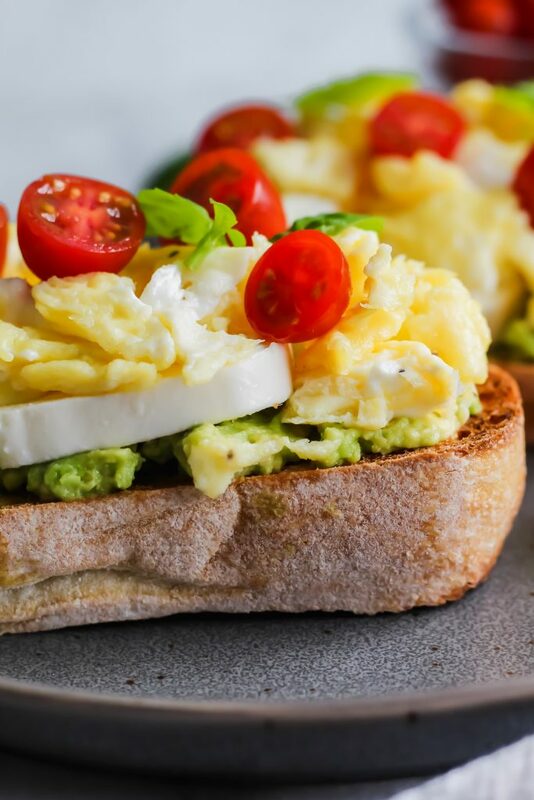 If you're looking for added protein in this recipe, add another egg to the scrambled mixture. Haylie, this is the perfect breakfast, YUM! The avocado on this looks fabulous! Thanks, Dawn! I never tire of it either!! It’s so delicious. Definitely gotta have the 3 slices of mozz! 🙂 Have an awesome weekend as well, my friend! I tried it this morning. The creaminess of the moz is game changing. You are speaking my language with this one!! Caprese-anything is a win for me! Delicious! 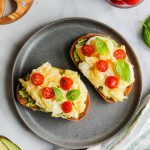 Perfect for breakfast or lunch! Thanks for sharing! Now that certainly isn’t your simple slice of toast and out the door in the morning. Looks great.